In 1976, NASA's space shuttle Enterprise rolled out of its manufacturing facility and was greeted by NASA officials and cast members from the "Star Trek" television series. 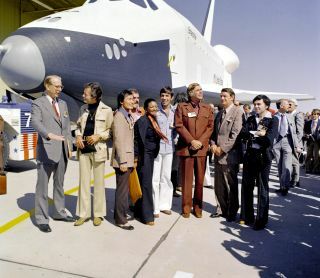 From left to right: NASA Administrator James Fletcher; DeForest Kelley, who played Dr. "Bones" McCoy on the series; George Takei (Mr. Sulu); James Doohan (Chief Engineer Montgomery "Scotty" Scott); Nichelle Nichols (Lt. Uhura); Leonard Nimoy (Mr. Spock); series creator Gene Roddenberry; U.S. Rep. Don Fuqua (D-Fla.); and Walter Koenig (Ensign Pavel Chekov). The hit series "Star Trek" celebrates the 50th anniversary of its television debut today (Sept. 8). Castmembers, astronauts and space agencies around the world have used social media to commemorate the series, tweeting photos and videos along with their congratulations. Here are some of their best tweets of the day. The original "Star Trek" series only ran for three years (1966-1969). But thanks to the support of its massive fan base, the franchise is sure to live long and prosper.